March was a busy month for energy efficiency projects in Heartland customer communities. Heartland awarded six energy efficiency grants to utilities for making street lighting upgrades and installing new meters. Miller, SD began a street lighting project upgrading 40 lights from high pressure sodium to LED. 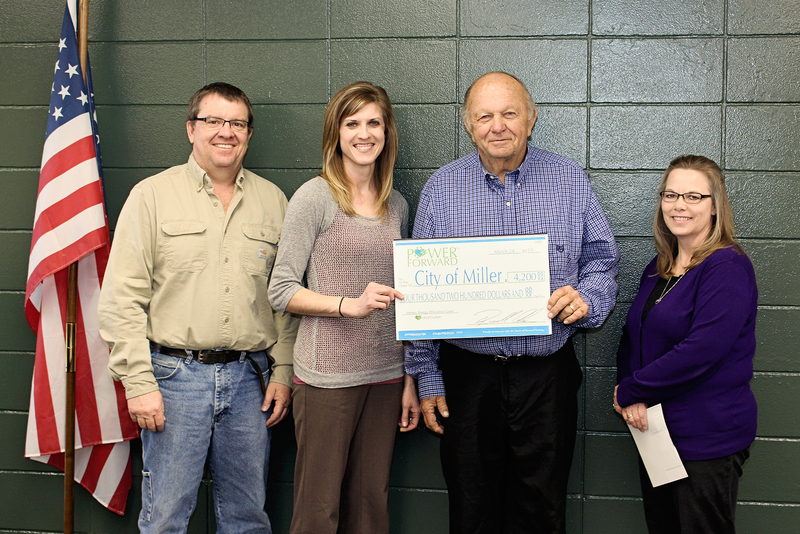 With annual energy savings expected at 14,510 kWh and a simple payback period of less than five years, Miller was awarded a grant of $4,200. Heartland Communications Manager Ann Hyland, second from left, presents an energy efficiency grant to Miller Electric Superintendent Bill Lewellen, Mayor Ron Blachford and Finance Officer Sheila Coss. Bryant, SD received a grant for $5,000 as they recently started upgrading street lights throughout the city, replacing 45 mercury vapor lights and six high pressure sodium lights with LEDs. The project is a viable one for the city with savings estimated at 29,842 kWh per year and a simple payback of three years. 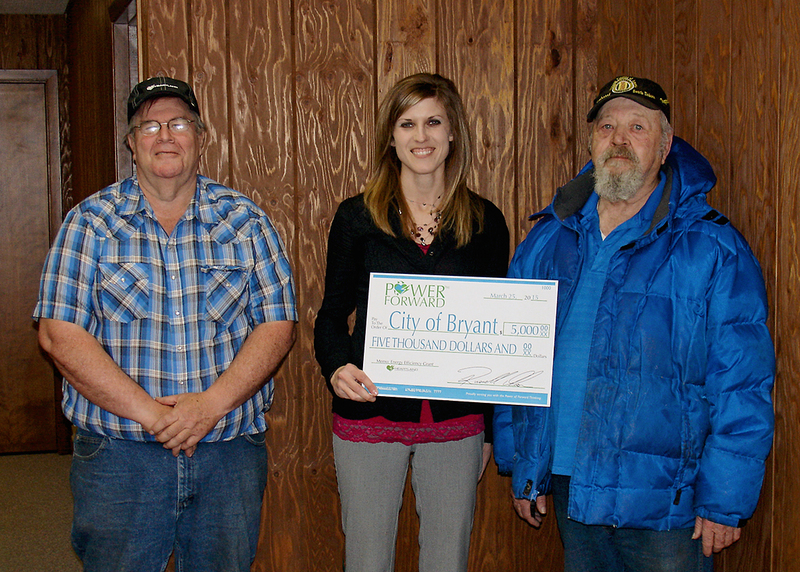 Heartland Communications Manager Ann Hyland, center, presents an energy efficiency grant to Bryant Electric Superintendent Garry Ladwig and Mayor Albert Yalowizer. Madelia, MN started the second phase of their street lighting upgrade this year, replacing 60 high pressure sodium fixtures with LEDs and receiving a grant of $5,000. Annual energy savings are expected at just over 36,000 kWh and the project is expected to pay for itself in energy savings in just over four years. 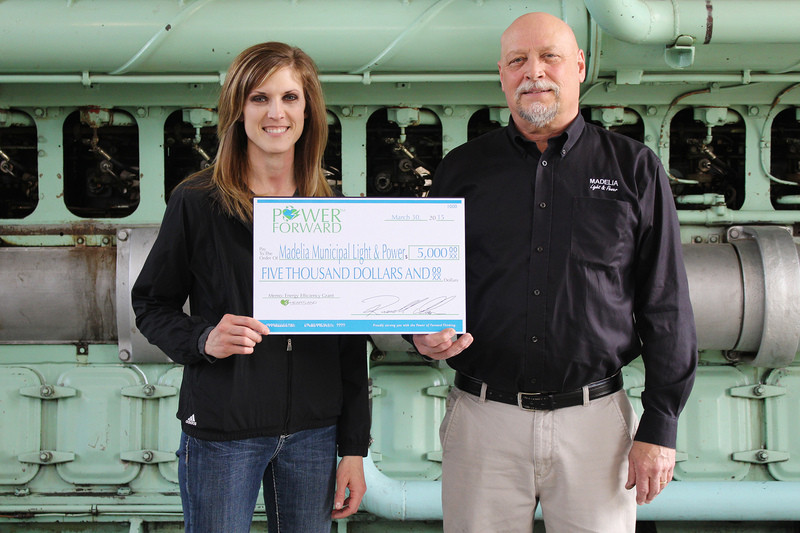 Heartland Communications Manager presents an energy efficiency grant to Madelia Municipal Light & Power General Manager Jim Maras. High pressure sodium street lights along the highway in Volga, SD are being upgraded to LED. The city was awarded a grant for $2,800 for replacing 18 fixtures for expected annual savings of 11,245 kWh and a simple payback period of just under five years. 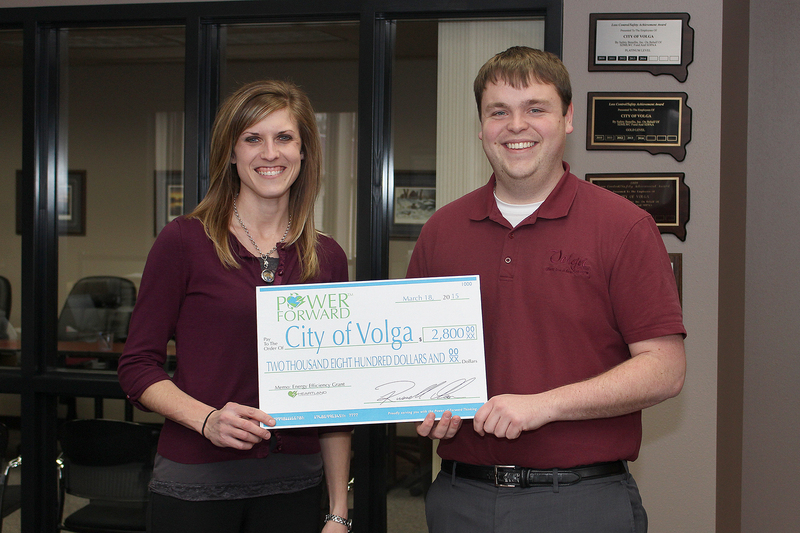 Heartland Communications Manager Ann Hyland presents an energy efficiency grant to Volga City Administrator Andrew Bremseth. 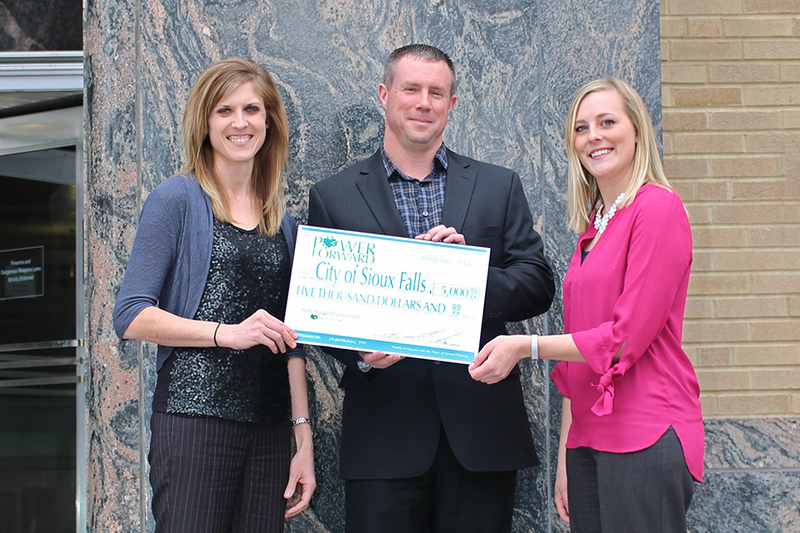 Sixty street lights are being replaced in Sioux Falls, SD for expected savings of just over 48,000 kWh annually. High pressure sodium lights in different sections of the city will be upgraded to LED and the project will see a simple payback of less than five years. The city was awarded a grant from Heartland for $5,000. Heartland Communications Manager Ann Hyland presents an energy efficiency grant to Sioux Falls Light & Power Superintendent Jerry Jongeling and Sustainability Coordinator Jessica Lantgen. 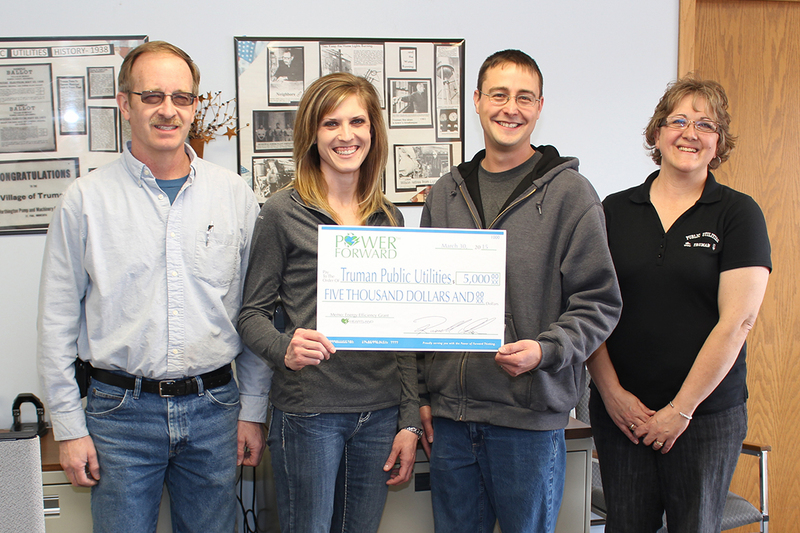 Truman, MN was awarded an energy efficiency grant of $5,000 for two separate projects. The city is upgrading 30 high pressure sodium street lights with LEDs for expected annual savings of 22,000 kWh and the project will pay for itself in savings in less than two and a half years. Truman is also upgrading a portion of the city’s electric meters with an AMR system. Heartland Communications Manager Ann Hyland, second from left, presents an energy efficiency grant to Truman Commission Chair Brad Nickerson, Public Utilities Foreman Justin Anderson and Public Utilities Office Manager Judi Davis. 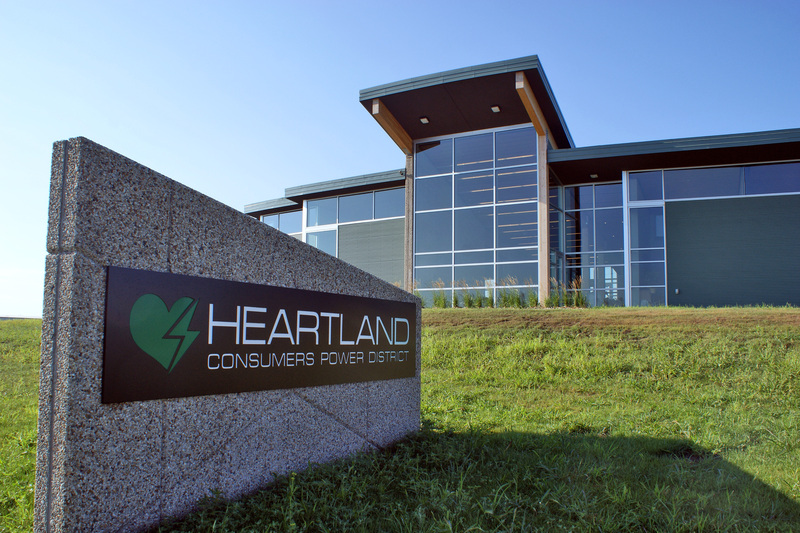 Heartland awards energy efficiency grants to customers for projects that improve efficiencies within the city. For more information contact Heartland Communications Manager Ann Hyland at 605-256-6536 or visit www.youcanpowerforward.com. Under the Environmental Protection Agency’s Clean Power Plan, “at least 43 states will face double-digit electricity price increases,” Sen. Jim Inhofe, chairman of the Senate Environment and Public Works Committee, said at a Feb. 11 hearing examining the EPA’s proposed carbon dioxide emissions rules for new, modified, and existing power plants. “Thirty-one states now oppose your Clean Power Plan,” the Oklahoma Republican told Janet McCabe, the EPA’s acting assistant administrator for the Office of Air and Radiation, who was the lone witness at the hearing. “I am concerned that your agency intends to impose the most expensive regulation in history yet fail to achieve your goals,” Inhofe said. An analysis by NERA, an economic consulting and analysis firm, says the EPA plan to reduce carbon dioxide emissions from power plants will cost “as much as $73 billion per year and upwards of $469 billion over the next 15 years,” he said. Inhofe noted that by mid-summer, the environmental agency plans to finalize three separate rules to reduce carbon dioxide emissions at power plants. Senators at the hearing questioned McCabe about the EPA plan, with Republicans generally opposing the plan, and Democrats generally supporting it. The ranking Democrat on the committee, Sen. Barbara Boxer of California, noted that power plants produce 40 percent of U.S. carbon emissions. She called attention to a recent report by the National Oceanic and Atmospheric Administration (NOAA) and NASA that 2014 was the hottest year on record. “Climate change is happening now – we can’t afford to wait,” she said. Chairman Inhofe and Sen. John Boozman, R-Arkansas, both cited a 2014 report by the Southwest Power Pool that warned that the EPA rule could result in cascading outages and voltage collapse. “I have concerns regarding reliability,” said Boozman. The SPP report found that significant new generating capacity will be needed, as well as new transmission. All this will be costly, and will hurt electricity customers, he said. In the October 2014 report, the Southwest Power Pool (SPP) said the EPA’s proposed rule on carbon dioxide reductions for existing power plants would hurt reliability. Under the current timetable for complying with the proposed rule, the SPP region could face severe overloads leading to cascading outages, the regional grid operator said. In comments it filed with the EPA on Oct. 9, 2014, the grid operator said there was a “very real possibility” of cascading outages, rolling blackouts and voltage collapse in several states unless the agency delays its compliance deadlines by at least five years. Boozman noted that the SPP had recommended that the EPA meet with the Federal Energy Regulatory Commission in areas covered by regional power markets, to discuss possible impacts on reliability. “Actually, those technical conferences are already scheduled, and the first one will be next week,” McCabe responded. McCabe said the EPA expects that the final Clean Power Plan, which it plans to issue by midsummer, will be different from the rule as proposed in June. She said the agency has received “unprecedented” public comment on the proposed rule, with 2 million comments filed so far on the rule for new power plants, and 3.5 million comments received so far on the proposed rules for: 1) existing plants, and 2) modified or reconstructed plants. “We are confident the final rule will be improved because of the input” from states, stakeholders, agencies and others, McCabe said. “We are preparing to provide states with the assistance they will need,” she added, explaining that the EPA plans to issue its proposal for a federal implementation plan (FIP) by midsummer. The agency prefers that states submit their own plans for complying with the Clean Power Plan, McCabe said. She noted, however, that the Clean Air Act calls for a federal backstop for states that either cannot or will not create their own plans. Fischer also questioned the “building blocks” proposed by the EPA as possible ways of complying with the rule on CO2. The Nebraska Department of Environmental Quality has said one of the building blocks is unachievable for her state, she said, asking McCabe whether the EPA planned to correct this. “We received many, many comments and are looking at them very closely,” replied McCabe, adding that the building blocks are meant as a starting point for states, not as requirements in and of themselves. “In the final rule, we very much want to maintain flexibility” as to how states meet the requirements, she added. Nebraska’s Sen. Fischer questioned the EPA’s assumptions on heat rate improvements at power plants, and noted that generating units are the most efficient when at full load. “These are important issues” that the EPA is examining carefully, McCabe said. “Will you commit to me that, when contacted [by Nebraskans], you will respond – and keep me updated?” Fischer asked. “I think you’ll be getting a lot of calls,” observed Fischer. “We’re happy to get them,” the EPA official said. “It’s clear that carbon is a problem,” said Sen. Benjamin Cardin, D-Maryland. “Carbon causing climate change is real,” and extreme weather events caused by the warming trend are costing billions of dollars, he said. “I support this rule wholeheartedly,” Whitehouse said. He urged his Senate colleagues to “look at both sides of the ledger” when thinking about this issue. The regulation of carbon dioxide “has been a long time coming,” said Sen. Thomas Carper, D-Delaware, who said his state has made significant investments in energy efficiency. He expressed concern about “inequities in the state targets” in the EPA plan. Carper pointed out that Delaware is a very low-lying state, subject to being eaten away by rising sea levels. “I’m trying to make sure my state remains on the map,” he said. “Ninety-five percent of our electricity comes from coal,” said Sen. Shelley Moore Capito, R-West Virginia. “We export half the electricity we produce.” She said she is worried about the costs the EPA rules will impose on taxpayers and electricity consumers in West Virginia. She also chastised the EPA for not visiting her state, which she said is the second largest producer of coal, after Wyoming. “States that are very coal-intensive will remain coal-intensive,” said McCabe, adding that she is from Indiana, another state that relies heavily on coal for its electricity. The Clean Power Plan “was designed in a way to acknowledge the differences” between states, she said. McCabe said the EPA expects coal to continue to have an important place in the U.S. energy mix. The agency projects that in 2030, coal will produce about 30 percent of U.S. electricity, with natural gas also producing 30 percent, she said. The city of Madison, SD has announced that it has added a new text message notification option. The sole purpose of this advancement is to better serve and keep the citizens informed of situations within the city. Text messaging is designed to communicate to mobile devices in the fastest, most reliable way. Text messaging is not designed to take the place of any current communication tools being utilized, such as email notifications. It will simply provide an additional resource for Madison residents. For more information, visit cityofmadisonsd.com. American Public Power Association’s street lighting package offers two publications and an online tutorial to help your utility manage and improve your street lighting projects. Street Lighting Best Practices provides guidelines for street light design, construction, operation, and maintenance. Buy this book and get access to an online training tutorial in five modules. LED Street Lighting Handbook: A Handbook for Small Communities offers guidance to utilities considering an LED street light retrofit. Learn how to analyze the costs and benefits of a retrofit and prepare bid documents, and discover what other communities like yours learned from their projects. Questions? Email Products@PublicPower.org or call 202-467-2926. HCPD customers: Don’t forget to visit youcanpowerforward.com to see if your project qualifies for funding assistance! American Public Power Association is offering a nine-webinar series beginning in February for public power board and city council members on electric utility governance. The series kicks off with “Public Power’s Unique Business Model and Governance Structure” on February 12. Featured speakers include Mark Beauchamp, president of Utility Financial Solutions, Dr. Jeff Tarbert, president and CEO of The Tarbert Group, LLC, and Joy Ditto, senior vice president of legislative and political affairs for APPA, among others. The webinars were developed primarily for those who are new to public power governance responsibilities, but individuals who have served for a number of years on public power city councils and/or utility boards, or utility staff who regularly work with utility governing bodies, may also find these sessions beneficial.